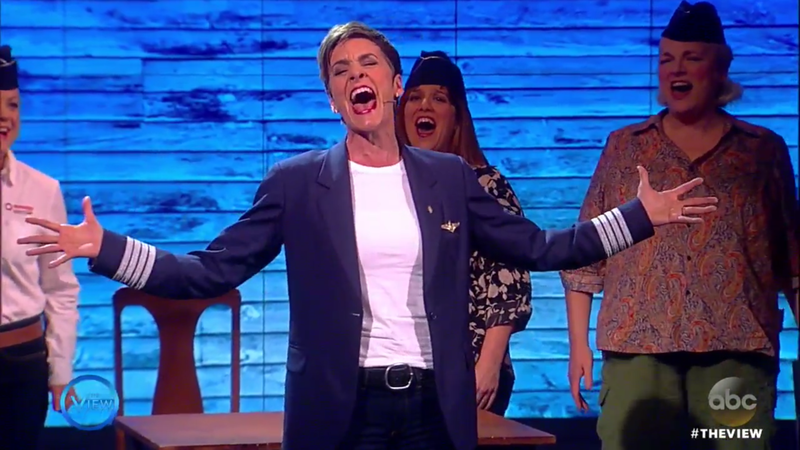 The real pilot Beverley Bass, who flew one of the planes diverted to Newfoundland on September 11, 2001, has seen the seven-time Tony-nominated new musical Come From Away 68 times. Along the journey of the new work about that tragic day in history, Bass has gotten to know Broadway actress Jenn Colella, a theater mainstay who is portraying Bass onstage. Colella, now a Tony Award nominee for her performance, visited The View with Bass and fellow cast members on June 2. She gave some insight into the show about a community of people who welcomed passengers from those planes with open arms. "It's a true story about kindness and compassion," said Colella. "These Newfoundlanders have reminded us that kindness is accessible at all times, not just in the wake of tragedy." Colella concluded her visit with her character's moving number "Me and the Sky."